Forum Index > Makers and Manufacturers Talk > Sabre Hungarian-Polish XVI / XVII century. Posted: Sat 13 Feb, 2016 11:53 am Post subject: Sabre Hungarian-Polish XVI / XVII century. Work done on basis the original pictures and some tips about scabbard. I will show You some photos how I worked and the final effect. ... is this a new project, TK ? This is a project that I have done. Yes, my Europe, there are many examples of old weapons from the folding elements from many countries. War, weapons captured. Trade, exchange gifts deputies diplomats. Making native decorations on the basis of the beautiful weapons of other countries. Several pictures of the work. This is final effect of the work. Sabre willl be used to train fancing. great work Tomek worth to admire. I like the wood work pictures. Gorgeous work, Tomek... You're tempting me to sell my car for that saber we discussed! Ha. Cheers! ... I echo my fellow forumites' sentiments, TK. Great stuff Tomek! I love it. Very deep curve and nice designs everywhere. Congratulations. Someone is very lucky to work with you on this one! It looks like a hungarian-style mounted ottoman blade (without fullers)! A joy for my eyes. Thank you all, Your words encourage a better job. 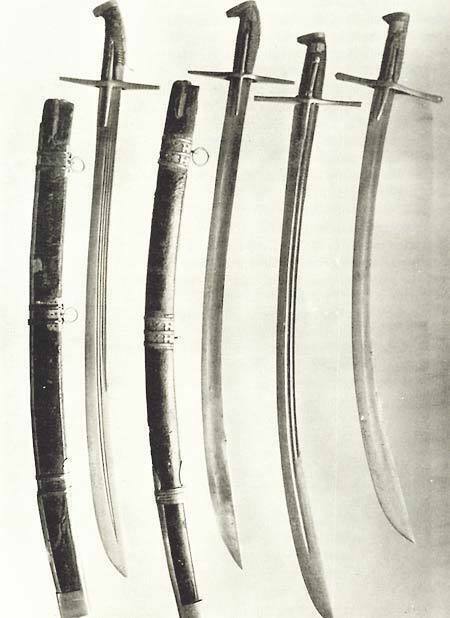 ... a collection of similar sabers of this type. Leo and Eduardo thank you. Eduardo I always I like your work and your photos with fun. I've always loved the Hungarian sabers from the first picture. They are a bit exaggerated and beautiful. I did have one with another Hungarian saber scabbard with old photos. Once again, thank you for watching. Curator of Beit Ussishkin, regional nature & history museum, Upper Galilee. The attention to detailing the level of finishing, just perfect. When I say perfect, I do not mean spotless shiny perfect, but perfect in the way that it is still recognizable as hand made. That gives it life and character. This is the first time I have seen your work. It appears to be great stuff. The fit and finish, the attention to historical sources, everything. I like it a lot. It is what I aspire to do with my own work. Thank you for sharing your swords, and the information, with us. If there is a soul in prison, I can not be free!